I was delighted to speak at Think it Possible's annual Breaking Bread with a Professional event earlier this month, when over 100 young people aged between 16 and 23 gathered to hear from specialists in a wide variety of industries about what they do and how they got there. Think it Possible is a unique social enterprise that tackles the lack of social mobility in society by connecting young people from diverse backgrounds to professionals from all sectors of work in the UK. The flagship Breaking Bread event exemplifies the charity's aim to empower young people to break into all aspects of professional work and not let any form of barriers get in their way. 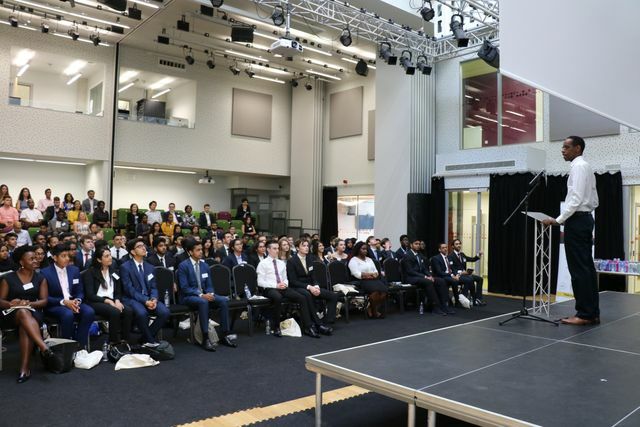 The one day event was opened with an inspiring speech by Hashi Mohammed, Barrister at No5 Chambers and broadcaster at the BBC, who spoke about his unique journey to becoming a Barrister and his position as a respected commentator on issues such as social mobility and child refugees. Other companies and organisations involved throughout the day included LexisNexis, Mayer Brown and the Department for International Development. My talk to a small break out session of approximately 20 young people discussed life in legal PR, what it is and what I do. I went on to speak about the skills and education needed, entry routes - including apprenticeships through the PRCA - and why it is such an interesting and enjoyable career. Byfield has been working with Think it Possible for just over a year now, but I know they are always keen to expand their roster of professional supporters. So, if you're interested, then please do get in touch. The young people were warm, enthusiastic and clearly committed to their careers. It was a pleasure to be involved.